Do I need protein to improve my fitness level? The best gift that you can give yourself in this lifetime is to be healthy and fit. However, you can never really know how fit you are simply by looking at yourself in the mirror (unless you are highly overweight). Knowing how fit you are is crucial before starting a new exercise or diet regimen, or simply for knowing what areas of your body you need to work more on. So how do you assess your fitness level? How do you know how fit you are? Body Weight: Your weight is the easiest indication of your fitness level. If you are overweight for your height and age, then you can easily pronounce yourself unfit easily. However, this might not be an absolute indication since in some cases, you might have a high bone or muscle density, rather than fat deposits, which might be taking your weight up the scales. So make sure that you also check out the other parameters for determining how fit you are. Blood Pressure: Gone are the days when only old people suffered from high blood pressure and heart attacks. 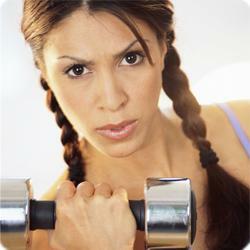 Before you start on an exercise regimen or a strict diet, check your blood pressure. You can buy a portable blood pressure meter from your pharmacist at an affordable rate nowadays, or get your blood pressure checked by a professional. If your blood pressure does not fall near the 120(systolic) and 80(diastolic) readings, then consult a physician before starting your exercise regimen. Waist to Hip Ratio: Abdominal fat not only makes you look ugly, but it is also an indicator of serious health risks. Measure your waist at the navel and your hips at their widest area and divide the waist measurement by the hip measurement. If the ratio is more than 0.95 for men or .80 for women, then you really need to improve your fitness level. Flexibility: Being fit means being flexible. Test how flexible you are by sitting on the floor with your legs outstretched and then try and touch your toes. Even if you cannot touch your toes, it does mot mean that you are not fit, but if you manage to reach only a little past your knees, or not even there, then your fitness level is a big problem. Heart Rate: Your resting heart rate is a simple indication of your overall fitness level. Count your pulse for 10 seconds while you are still on your bed after waking up in the morning. Multiply this number by 6 and you have your resting heart rate. In healthy individuals, this should not be more than 60. With a resting heart rate of more than 60, your fitness level is not up to the mark and needs to be worked upon.